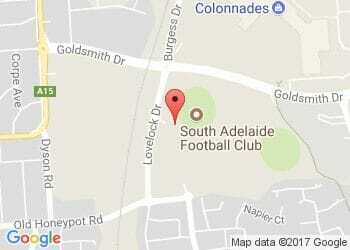 Since "Westies" joined the SAFA in 1897 there have been countless contests between the South Adelaide and West Adelaide Football Clubs. Although what may be the most significant link between the two clubs is SANFL legend Neil Kerley. Kerley was inducted into the South Australian Football Hall of Fame in 2002, recognized for his long list of football achievements as a player and coach in the SANFL between 1961-1990. Heading into our Round 18 clash with the Bloods, we take a quick look back at the legend that is Neil "Knuckles" Kerley. Neil was born and raised in the Riverland and played his first game of league football for West Adelaide at the age of 19 in 1953. In the 10 years that he played at the club he established a reputation as a talented and tough footballer, who was a natural leader on and off the ground. He earned himself the nickname "Knuckles" due to multiple finger injuries which led to several subsequent deformities, although further emphasized his hard-nosed style of play and never-say-die attitude. In a time when players generally stuck to their primary positions, Kerley was a versatile footballer who could play all around the ground. This included being very successful as a ruckman despite his relative lack of height (standing just over 6 feet tall). Kerley utilized his strength and explosive leap to make his mark in the middle. Whilst at West Adelaide Kerley played in five Grand Finals, (1956, '58, '59, '61, '62), four of which were defeats coming at the hands of the Fos Williams coached Port Adelaide sides, several of them nail biters where Kerley's Bloods came within two and three points. Finally, in 1961, the season that Kerley took over as player-coach, West Adelaide were able to break the drought and won the Premiership, taking down Norwood by 36 points. The game which ended West 16. 13 (109) to Norwood 11.7 (73) was played in 35-degree heat and became known as "The Turkish Bath Grand Final." On the day, Kerley recorded 23 kicks, three handballs and six marks in the ruck and was named as best on ground against the side he supported as a child. During his time at West Adelaide Neil was a four-time Club Best and Fairest winner ('58, '59, '61, '62) and he also captained the South Australian side on six occasions ('59, '60, '61, '62, '65, '66). Although after the 1962 Grand Final loss and a drop in form throughout 1963 for the side, Kerley was ready for a change. During the season West was beaten by South and the talent of some of the oppositions players was not lost on Kerley. At the end of the '63 season the South Adelaide committee decided to not re-sign Denis Parham and instead pursue Neil Kerley to fill the senior Coach position as a player-coach. A decision which turned out to be a successful one. South signed Kerley at the age of 30 for the 1964 season, where he joined a strong squad which included the likes of Peter Darley, David Kantilla, Lindsay Backman and Ian Day. The once dominant club had endured 24 years since its last Grand Final appearance and it was Kerley who was motivated to make a change to that. Kerley built a super athletic and fit team with a near unbeatable engine room in the midfield and powerful defensive line led by Bob Schmidt, whom Kerley believed was "the best half-back flanker in the league." The season got underway and despite Kerley being unable to play for the first 7 rounds due to a clearance 'injustice,' he coached from the sidelines to a 6-1 record. The side would go on to finish the minor round in second place by percentage, tied with Port Adelaide with a 17-3 record. Going into the fourth quarter of the second Semi Final between South and Port, the Panthers held a strong lead with the scores at 79 to 42. Although Port were able to steam home and finished the game with a one point lead (92-91). Kerley was bitterly disappointed, conceding that had used defensive tactics in the last quarter to try and maintain the lead, a tactic which he resolved to never use again. South went on to roll past Sturt in the Preliminary Final by 41 points and looked again to Port Adelaide for the Grand Final. South came out early and controlled the game, holding the Magpies to only 10 minor scores throughout the first half and leading by 27 points at the final siren, shortly after which Kerley was chaired of the ground as the leader of the premiership team. Kerley would go on to lead the Panthers to two more finals appearances in the following years, losing a controversial Prelim' to Port in '65 and then to Sturt in the Semi in '66. At South Neil became known as King Kerley and cemented himself in the Clubs history books having come in and taken a bottom of the ladder team in '63 to a premiership winning side in his first year.